Summon your Doman magpie minion. Approximately 3.14159 times more intelligent than the average swallow. 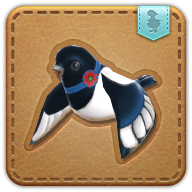 Magpies have historically been portrayed as loyal messengers of Menphina, bearing the word of the Lover's favor in war. There are some generals even today who will wait to advance their armies until one of the birds has been sighted on their side of the battlefield.